This preview of Mrs. President, Victoria Bond‘s opera about women’s equality pioneer Victoria Woodhull that is set to have its official premiere in Anchorage, AK this October, was presented as simply a “Mrs. President in Concert”, with the principal singers performing in concert wardrobe instead of the costumes you’d expect to see for the fully-staged opera, and the music was performed not by an orchestra, but with piano accompaniment by Richard Gordon. And there was also no chorus. The concert reveals Mrs. President to be sort of a work-in-progress. Having said this, I’m happy to say that this preview of Mrs. President was far from disappointing. Even the trappings of a non-staged preview of an operatic work don’t necessarily stop the work from revealing its true beauty, and potential vibrancy. Without grand fanfare (and with the aid of WQXR’s Naomi Lewin serving as a narrator specifically for the preview), the principal cast came out in the darkness of the small stage, and from behind podiums, gave readings of the story’s characters that had me imagining a more fully-realized production. The radiance of soprano Valerie Bernhardt transports Victoria Woodhull to a virtually iconic place for opera heroines as her character advances to her greater familiarity as a political figure. Her equal for the male singers is definitely Scott Ramsay as the popular orator Henry Ward Beecher. In his own dramatic developments, Ramsay gives a fiery performance that accentuates both the character’s flair and anger. The opera’s finale of Victoria Woodhull being joined by a chorus of ghosts in her image (portrayed here strikingly by the other female leads) is an explosive one that exudes reassuring hope, and serves as the perfect statement and resolution for the once-doomed movement that Woodhull had started. Victoria Bond conducted her own work at this performance, and I have to say it was a pleasure to be seated nearby as she passionately did so, as if I had been sitting next to Beethoven conducting the Ninth Symphony. There is nothing as wonderful in my book as the composer working as either a conductor or musician with their own pieces, and it was quite obvious that I was witnessing Bond sharing the fruits of her personal labor for the better part of 10 years. Who better to conduct it? Mrs. President, the fully-staged opera, is bound to be an American opera classic. 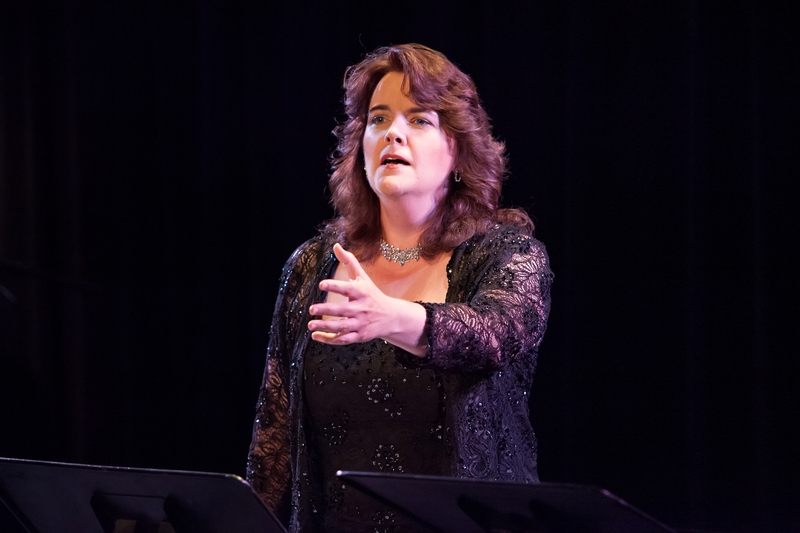 This entry was posted in Concert reviews, New Classical Music, Opera, Theater and tagged Anchorage Opera, Mrs. President, Scott Ramsay, Symphony Space, Valerie Bernhardt, Victoria Bond, Victoria Woodhull. Bookmark the permalink.